The latest research report by Zion Market Research (ZMR) states that the global insect growth regulator market is representing an enormously aggressive business environment with the charisma of a number of dominating market players. Some of the important players in the global IGR market include Bayer Crop Science AG, ADAMA Agricultural Solutions Ltd., Syngenta AG, Dow Chemical Company, Platform Specialty Products Corporation, Nufarm Ltd., Central Garden & Pet Co, Sumitomo Chemical Company Ltd., and Russell IPM Ltd. Numerous market players in the global insect growth regulator market are often engaged in various strategic moves such as mergers & acquisitions to maintain their market share and expand their product portfolio. Additionally, key parameters affecting competition are the fast adoption of advanced options and an increasing requirement for optimum capital utilization. On the basis of product type, the segmentation of the global insect growth regulator market is done into chitin synthesis inhibitors, juvenile hormone analogs & mimics inhibitors, and anti-juvenile hormone agents. The chitin synthesis inhibitors segment in the global insect growth regulator market is proposed to show growth at the highest rate in the upcoming period. Based on the type of form, the global insect growth regulator market can be segmented into liquid, bait, and aerosol. The aerosol segment in the global insect growth regulator market is expected to show the maximum CAGR during the upcoming period. Aerosol insect growth regulators are easy to store. Due to the convenience at the time of their purchasing in a smaller amount, aerosol insect growth regulators are more preferred over other forms such as bait or liquid. Residential, agricultural, commercial, and others are said to be the important applications segments in the global insect growth regulator market. In 2017, the agricultural segment in the global insect growth regulator market demonstrated its dominance in terms of revenue. North America, Europe, Asia-Pacific, Latin America, and Middle East & Africa are the important regional segments in the global insect growth regulator market. The North America and Europe region in the global insect growth regulator market are projected to maintain their leading position in the upcoming period. 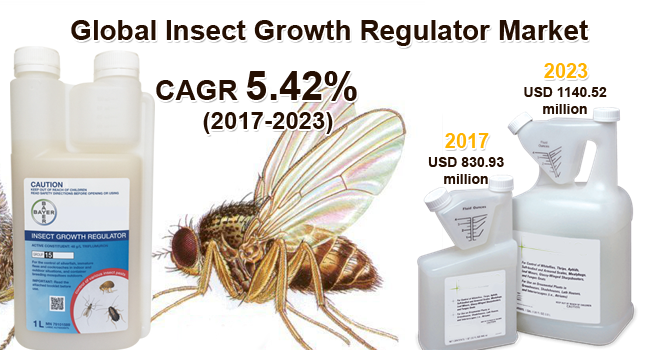 Significant growth in advanced formulations of insect growth regulators is propelling this region in the global insect growth regulator market. Similarly, the presence of numerous well-known firms in this region is also responsible for the development of this region in the global insect growth regulator market. Numerous countries in Asia-Pacific region of the global insect growth regulator market are witnessing increased agricultural sector and improved demand for the less toxic chemicals that would cause no or less damage to crops in comparison to the other synthetic chemicals employed. Insect growth regulator products are seen to be restricting the development of insects without any adverse effect on the atmosphere. ?